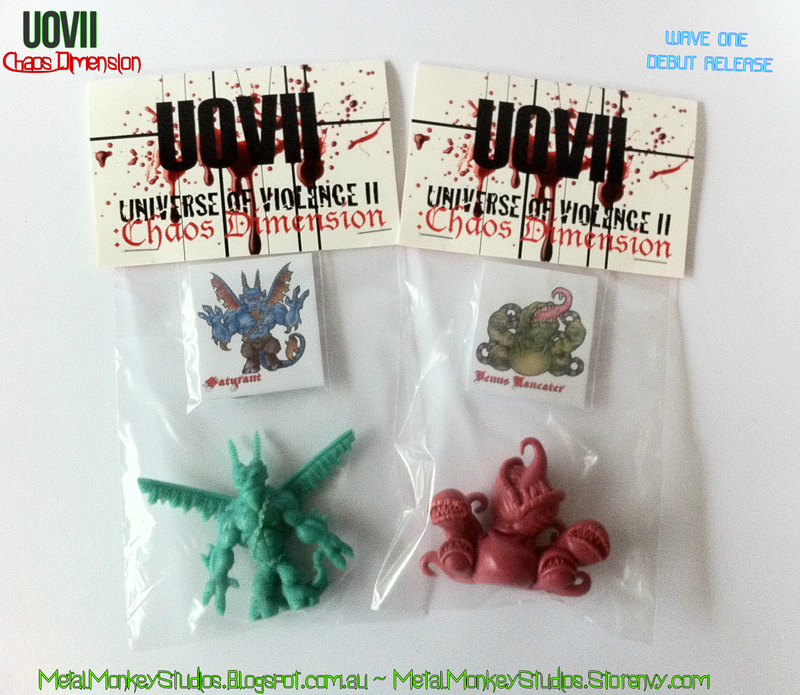 Universe of Violence II: Chaos Dimension Wave One figures will be added to my store in the coming hours, but no later than 24 hours from now. My store will be closed briefly and reopen shortly after. I'm refraining from doing the usual drop with a preset time and date to try and make the hunt more fun, rather than staking out waiting for the time to tick over. It's my first time selling my own stuff, so I'm testing the waters a little here. As mentioned earlier, Wave One figures Satyrant & Venus Maneater will be available for $12 AUD each, and come bagged with a custom header card, mini art card (with stats) & an UOVII button badge. Wave One figures will be sold randomly this time around, so you won't know which ones you got until they get there. Hopefully the surprise makes it more fun! The limit is set at 2 of each figure per person and still applies (max of 4 figures). Eric of Eric Nilla Customs has cast these beauties in his awesome Task 16 Urethane rubber which is really similar to what Monster In my Pocket where made from, and are extremely vibrant & durable. Why not go check out his store and see all the cool stuff he has to offer, from custom Keshi castings to original keshi & minifigures goodies! They were also made using Wolf's incredible dusts & pigments (like glow dusts & ultra-thermal dusts) which are available at his store, Solar Color Dust. Everyone who's seen these dusts at work, know how truly awesome they are! Lastly, here are some charts that show each figure on offer so you have some idea what to expect. 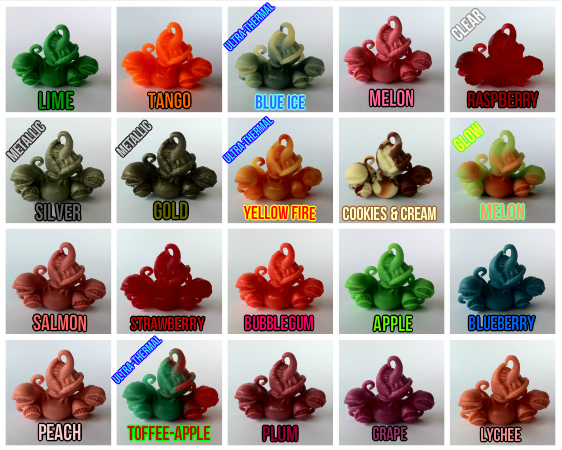 All orders will be randomly picked from the figures pictured here. As you can see the colours that make up Wave One include marbles, clear, pearl, metallics, ultra-thermals & glow-in-the-dark figures mixed in with some standard coloured figures. Enjoy! Again, if you're hoping to pick up one of these guys then keep an eye on my store over the coming hours! Regarding shipping, I've never sent these abroad yet but I know Australia Post charge AUD $12.70 to send a box to the U.S so this is what I'll charge unless I can get it cheaper. I prefer to send these by box rather than a parcel pack or envelope and at their size (pretty bulky) I dont think the tiny saving would be worth it. If I accidentally overcharge anyone, I'll refund you the difference back right after. If anyone have any questions they can post them here, PM me over at Little Rubber Guys forum, contact me thru my storenvy or even Facebook.